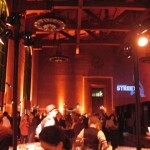 Last Saturday, Jonathan Gold hosted his second annual Union Station Speakeasy Cocktail Party, featuring cocktails by the bars of 213 and gourmet bites from some of L.A.’s top restaurants. The event was a fundraiser for Zócalo Public Square, a Los Angeles-based nonprofit that provides a nonpartisan forum to prominent thinkers and doers via lectures, panels, salons, screenings, webzine and annual conferences. 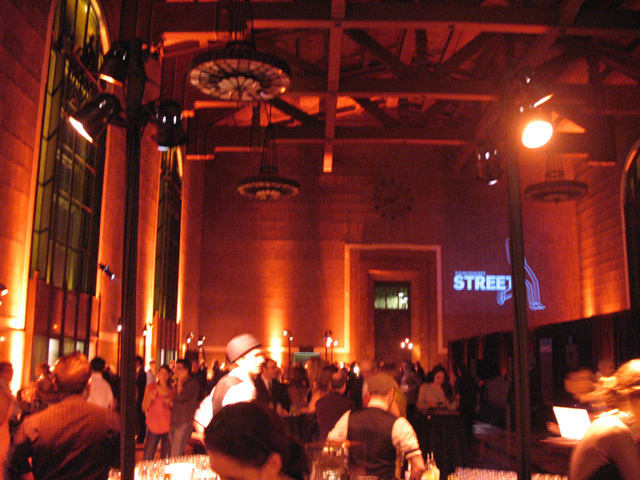 Joining me for the imbibing and dining was Laren of Sweet Blog o’ Mine, who was making her first visit to L.A. After a seemingly endless walk from the parking structure we arrived at Union Station’s beautiful Grand Ticket Concourse, a soaring space that’s normally closed off to the public. Despite the size of the room, a stifling heat lingered throughout the party. 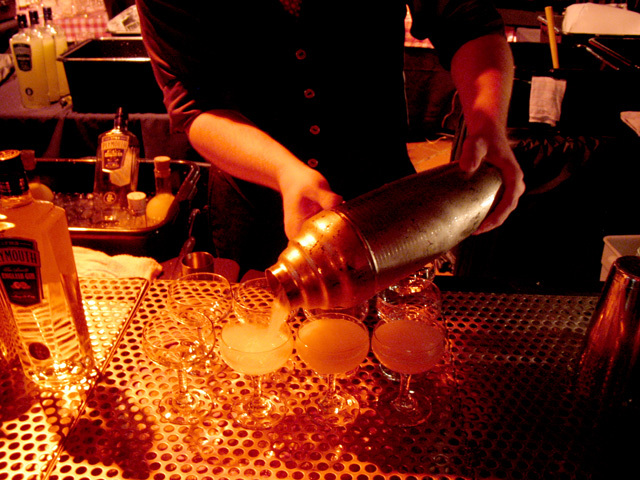 The sharply-dressed crowd handled it in stride and kept the bartenders and chefs busy right up to the end. Our first stop was the Caña Rum Bar station, where GM Allan Katz, bartender Danielle Crouch and Celebrity Barback Ron Dollete (Lush Angeles) were serving up the Cruzan Rum Ace of Spades, featuring Cruzan 9 Spiced Rum and cacao-infused bitters. Easily my favorite cocktail of the night, a wonderful blend of flavors highlighted by vanilla and chocolate notes. A sizable dance floor was created for guests to groove to DJ Garth Trinidad (KCRW), but with the heat it took a while before guests felt the need to get down. I think a period band would have made more sense for a “speakeasy” party, but maybe that’s just me. Though I appreciated the spacious event layout, we definitely could have used more two tops. 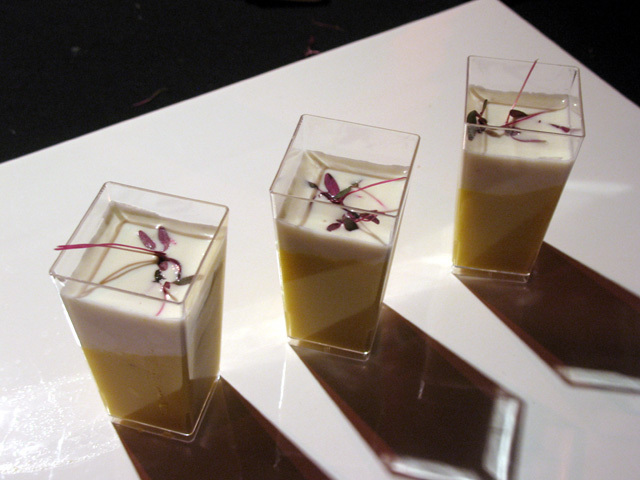 With available tables at a premium, guests had to be a little creative with how they enjoyed their food and drink. Luckily we found the Cool Kids Table, where e*star LA, L.A. & O.C. Foodventures and others were tasting the offerings, comparing notes and offering suggestions. Better yet, they had commandeered a table right by Cole’s Red Car Bar, which was stirring up the Pikesville Classic Manhattan: Pikesville Rye, Dolin Sweet Vermouth, Angostura bitters and a Luxardo maraschino cherry. 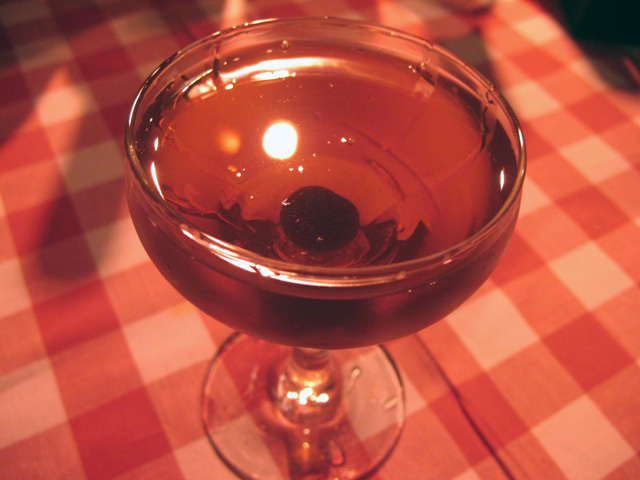 I loves me a Manhattan, especially with rye and particularly when the spicy and sweet notes are so well-balanced. 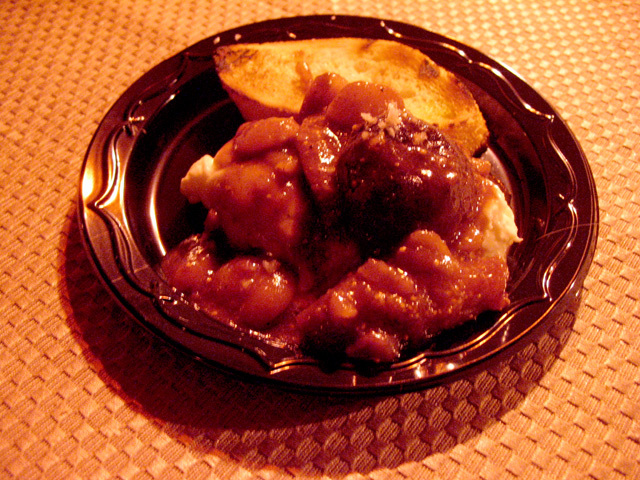 Guests snapped up the Plymouth Fitzgeralds as soon as Chris Bostick made them. 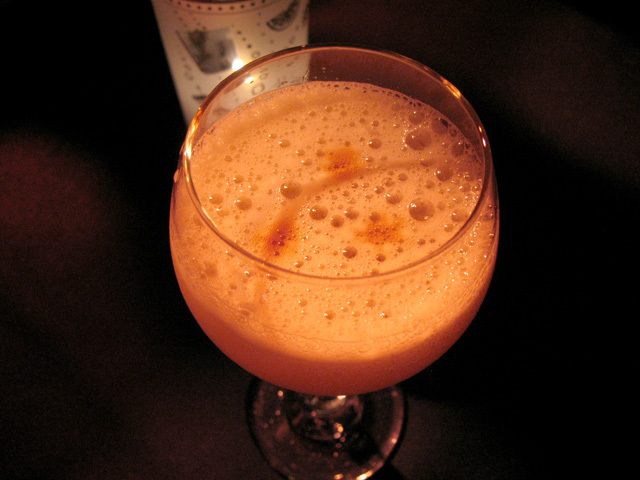 Cole’s was naturally set up back-to-back with The Varnish, where Eric Alperin and Chris Bostick were mixing the Plymouth Fitzgerald, a classic gin sour made with Plymouth Gin, fresh lemon juice and sugar, shaken and served up and with a drizzle of Angostura bitters. 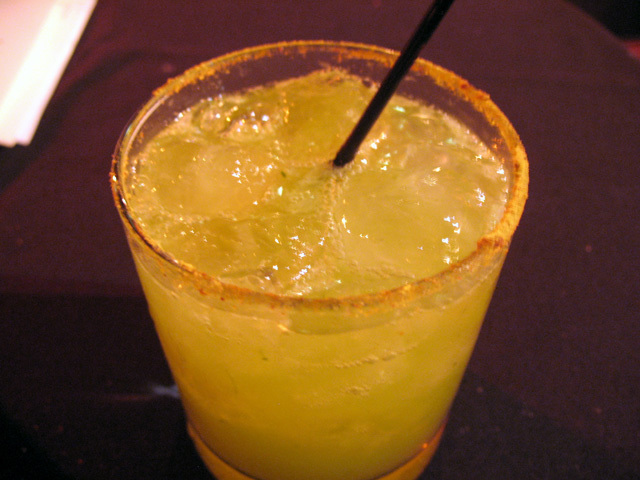 The bright, tart cocktails were quickly grabbed by thirsty guests as soon as they were mixed. Rustic Canyon: black mission figs, roasted chestnuts, burrata, saba and toast. Nearby, Rustic Canyon and Providence were set up next to each other, with very different, delectable tastings. First up was Rustic Canyon, with its healthy-sized serving of black mission figs, roasted chestnuts, burrata, saba and toast. 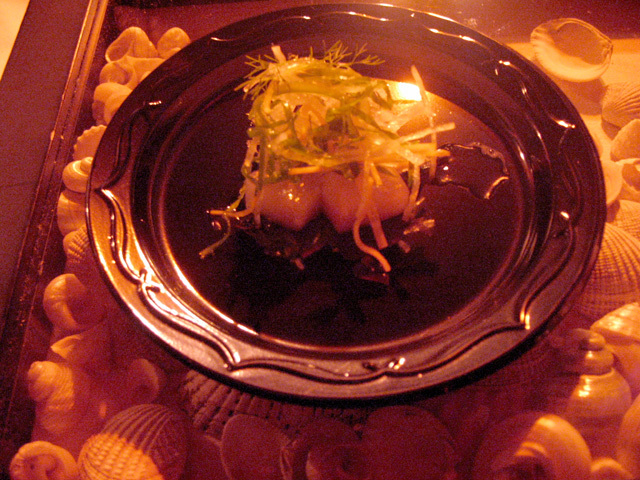 Providence: hamachi with nuoc cham and beef tendon. Providence’s hamachi with nuoc cham and beef tendon was subtle and refined, a nice contrast to the hearty Rustic Canyon dish. Not so successful was First & Hope, whose butternut panna cotta was topped with a crab salad so oversalted I couldn’t finish it. Thankfully Neal Fraser (Grace) came to our rescue by serving us his melt-in-your-mouth braised pork and squash flan, with a smoked sage jus. Next to Grace was Lazy Ox Canteen and its bite-sized yellowtail crudo tacos with avocado, crème fraiche and white soy. I also tried Jar’s pork croissant with mustard sauce, but it had a tough act to follow after Grace and Lazy Ox. 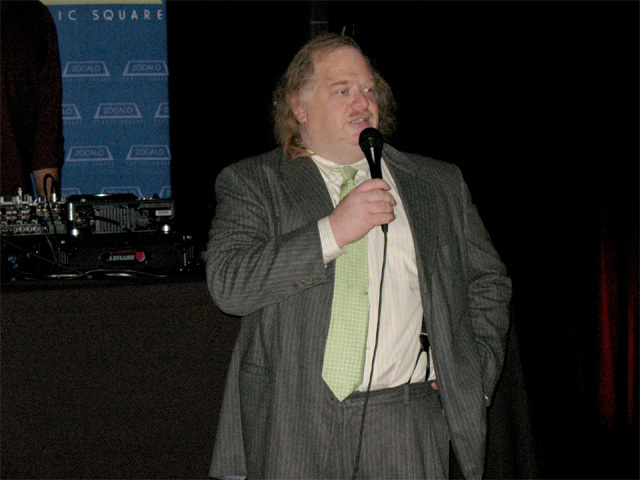 Then it was time for a few words from Jonathan Gold, who thanked everyone and encouraged the continued support of Zócalo. 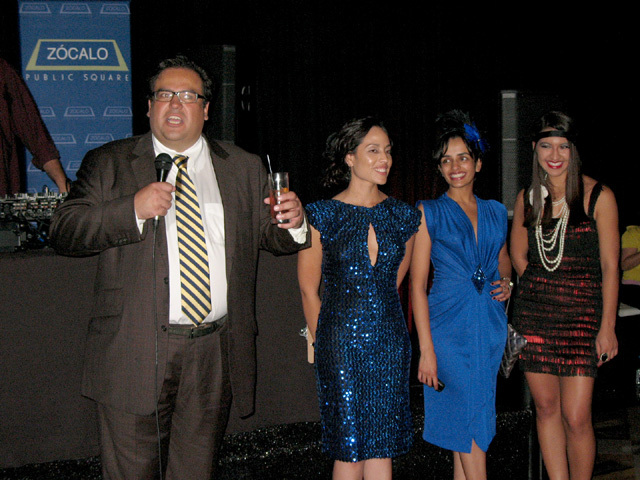 (L to R) Zócalo founder Gregory Rodriguez and his staff: Laura Villalpando, Swati Pandey and Dulce Vasquez. Gold introduced Zócalo founder Gregory Rodriguez and his staff: Laura Villalpando, Swati Pandey and Dulce Vasquez. By this time the energy (read: booze) had kicked in and the dance floor began to fill. But there were still a few more stops to make and tastes to try, starting with Rivera’s Gazpacho Blanco, a shot of pre-Columbian white gazpacho that went down so nicely I had to grab another one to go. A few steps away was Las Perlas, continuing the Latin theme with a Spiced PaQui Tequila Daisy: PaQui Silver Tequila, fresh lime juice, organic agave nectar, fresh juiced jalapenos, basil, and cucumber. The bartender asked us how spicy we wanted them, and she wasn’t messing around when we asked for them to be hot, just how we like ’em. Seven Grand was serving a selection of Chivas Regal 12-Year Scotch Highballs, but we passed. Then it was back to where we began the night, and one last Ace of Spades. With the party winding down, we were all dressed up with nowhere to go. A trip to the real Varnish seemed to be in order, and despite being exhausted from jet lag, Laren was a trouper and we headed out into the night.